Story from 1999 coordinator - As coordinator a great deal of the mail I receive is from folks with memories to share about their days in Barry. The story that is told most often is about the C&E railroad and how it is among their fondest of all memories. What is below is a very brief history of this railroad, the source for the information is a lengthy story written by Irene Horner and published in the book "Back to Barry." What I do know from all of that mail is that the history below and probably any other that has ever been told will never come close to retelling of the love and happiness that a railroad and 4.8 miles of track could give to an entire generation. The old C&E Short-line is but a memory now, but it is a memory that will live on forever in the hearts of those who knew her. The laying of tracks began in Exeter on June 11, 1896 and they were laid into Cassville on June 20th. On July 4th 1896 during one of the biggest celebrations ever known, the first train steamed into Cassville. The name of this little short line which connected Cassville to to the Frisco line in Exeter was "The Cassville and Western Railroad." For many years this railroad was the only way into Cassville as most of the roads would be impassable during bad weather. Both passengers and shippers depended on it for transpiration from the Frisco line in Exeter. This tracks stretched from Cassville 4.8 miles to the Exeter switch and went uphill from Cassville to Exeter. The engines would use their steam power to go uphill and without a way to turn around in Exeter, would make the return trip by coasting into Cassville backwards, letting gravity do the work. On Oct. 4, 1917 when a tragedy occurred (See Home Wrecked by Cars, Miss Ruth Bloomer Killed) it seemed to be the forerunner of events which eventually sent this little railroad into bankruptcy. 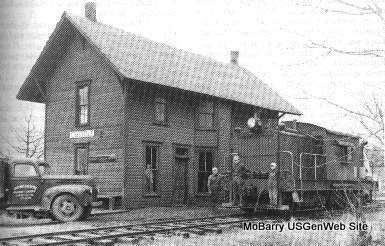 The Cassville C&E Depot and "Old Number 20" or "Mary Ann" as she was more commonly known. She was the first engine purchased by David Dingler for the C&E in 1919. The photograph shown at left was taken by Max Fields, deceased circa 1956/1957. The people shown in the picture are the Ashley family. The three on the engine are Mr. Ashley, (first name not known) and his two sons, one of which is named James. Mrs. Ashley in shown in the window watching the procedure. Max believes that that the engine was a Diesel/Electric one. In the 1919 two Cassville businessmen David Dingler and J.C. Ault became the owners of one engine and five miles of track. It was decided that J.C. Ault would handle the books and David Dingler would take care of everything else. An announcement was made that service would be improved, a new locomotive and tires would be purchased along with an overhaul of the line and equipment. This change in ownership saved the little railroad from junking and soon the new owners announced that the railroad had a new name, "The Cassville and Exeter Railroad," or the C&E as most folks know it. In February 1919, they added a shiny pullman green and tomato red 24 seat passenger car which hauled passengers from Cassville to Exeter and met returning trains hauling them back to Cassville. In the 1934, campaign for the US Senate in Missouri, Harry Truman traveled the C&E Railroad. The late president spent the night on the 24 seat passenger car in Cassville as a guest of David Dingler. Two round trips were made daily and the citizens always knew they would have 12 hour freight service and dependable passenger connections. David Dingler was a businessman but he also wanted to enjoy the work he loved so much, so each spring when school was out he ran the "Exeter Excursion" and a free round trip ride was given to all of the Cassville school children. One summer he noticed the ponds along the railroad were dry and worried about the birds finding water, he had his crew carry a hose to the engine and it was used to refill the ponds. Though passenger hauling never paid for the railroad, for a 25 cent fare each and every passenger was greeted and welcomed aboard. The ride to Exeter and back soon became a must for local folks on an outing along with the summer tourists who couldn't miss this ride and all were treated to the beauties of the valley between Cassville and Exeter, along with conversation of nature, education, politics and probably a few tall tales with David Dingler. The Exeter store fronts with the railroad tracks in the foreground. The street on the left side leads east to Cassville. In time, the railroad was not only showing a profit but receiving publicity in newspapers from coast to coast. Among its claim's to fame was a featured story in the December 12, 1926 issue of The New York Times, in 1931 it was featured in "Ripley's Believe it or Not," in 1937 it was featured in pictures and story in Newsweek and many, many more. I feel the most honored of all was that it was used as the setting for the radio show "Clem & Martha" which aired in the late 1930's - early 1940's. The writer of this show was Merwyn Love of Des Moines, Iowa. His father, the Rev. E.W. Love was a presbyterian minister in Cassville, who met his wife at the depot where she was a ticket taker and Merwyn was virtually raised aboard the old train. He also stared in the show as Clem, which was a role that in real life was held by David Dingler. In 1939 J.C. Ault was killed in a motor accident and David Dingler retired due to poor health then died in November. The families were determined to keep the railroad going and the widows stepped in to take things over. The little train continued to make its runs and the railroad operated successfully however, by 1940 the old passenger car was only taken out of it's shed when the school children wanted to take a ride on the "Exeter Excursion." Frequently there were one or two passengers who needed a ride and they were allowed to ride in the engine or a box car and freight business was still profitable enough to pay the salaries of the employees and turn a small profit. Hard times hit the railroad during World War II but Mrs. Ida Dingler and her daughter-in-law Mrs. Ray (Lona) Dingler kept things going until Ray Dingler (son of David & Ida) returned home. Five veteran employees, all up there in years kept the old train going for the women but by the time Ray returned the railroad was in horrible shape. The line was run down from shortage of repair material, old Number 345, which had replaced Mary Ann in 1935 was on its last leg and most of the veteran employee's had died. The depot in Exeter and Number 345. In 1946 Ray was busy scouting around for material to repair the track and a replacement for the old engine. The schedule wasn't very exact anymore, it was down to making one run a day and any track repairs were done by stopping the train during a run, getting out, fixing the problem and continuing on. The run which use to take 25 minutes was now taking an hour and twenty minutes, "we have plenty of time and we just take it slow; there's not much speed left in the old engine" said Engineer Bert Anderson. But Ray got things moving, some tracks were repaired and he purchased a rebuilt locomotive, Number 2644 from the Missouri Pacific Railroad. Though there were fewer trips to Exeter, things were looking up and it looked like the railroad might survive. Mrs. Ida Dingler died in 1947 and Ray stepped up as the president. He kept the railroad going for another two years but with the increase in automotive and truck transportation after the war, folks didn't need this old railroad anymore. Facing declining revenue and increasing operating costs, the final blow came with a freezing rain in early 1949 which caused much damage to the tracks and Ray along with his four stock holders, admitted defeat and gave up. Later that same year word went out that the C&E would run again. Hearing the plight of this little railroad, Arthur P. Wheelock of Des Moines, Iowa came to Cassville and interested local businessmen into forming a corporation and purchasing the C&E. Mowing operations and repairs were started in July of 1949 and the C&E operated again on a casual as needed basis until September of 1956 when after a steady decline of business the board of directors reluctantly decided to abandon operations. After 60 years of operating the locomotive made its last run from Cassville to Exeter on September 11, 1956.